UPPERS: Microfibre upper and strap closure. Elasticated tongue integrated in the upper. Optimum fit thanks to its Wrap Rand and uniquely sculpted toe rand. 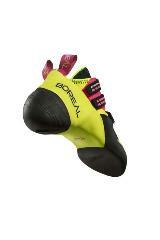 The highly downturned and asymmetric last shape cradles the foot and maximizes power at the toe. The innovative Wrap Rand™ surrounds and supports the foot, while the triple strap closure system keeps everything secure. The lined, synthetic upper with integrated elastic tongue ensures a comfortable fit with minimal stretch. An extended rubber patch over the toes and 3D moulded heel in our outstanding Zenith™ rubber result in exceptional toe and heel hooking ability, and the supportive midsole provides unsurpassed edging performance. 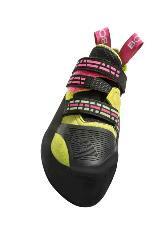 Dharma is the ideal shoe for sport climbers and boulderers looking for the highest performance available on steep rock. DHARMA | Pinnacle of sport climbing performance. 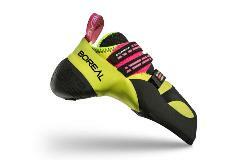 The highly downturned and asymmetric last shape combined with supportive midsole and BOREAL® Zenith Pro rubber mean that Dharma excels on the World's hardest, steepest climbs.